Gosh Garnet, Where Did 2016 Go?! Happy New Year, friends!! Hope you've all had a wonderful, relaxing holiday season recharging for what's to come in 2017! I certainly enjoyed my time off work. I spent my free time trying out new cake recipes, reading (I finished two books y'all!!! ), and spending lots of time with my family and friends. I'm sad that the break is over, but boy oh boy was it great! I do love January. I love the fresh start. I love the excitement and anticipation it brings with the new year. And I especially love the motivation it gives me! Before every New Year, Zach and I discuss some of our goals for the next year. Sometimes they are mostly home-improvement related, sometimes they are more relationship related, but ALWAYS on the list is working out. ALWAYS at number one. Guess how many times this girl has been to the gym this year?! 3 times. That's right, 3 times. And I plan to go tomorrow too! I'm on a roll! #cantstopwontstop Wish me and my fitness journey good luck this year!! I really wanted the flavor of the month for January to be something funny and topical - since everyone and their dog sets New Years goals of working out and eating healthier, I thought it would be hilarious to make KALE the flavor of the month. 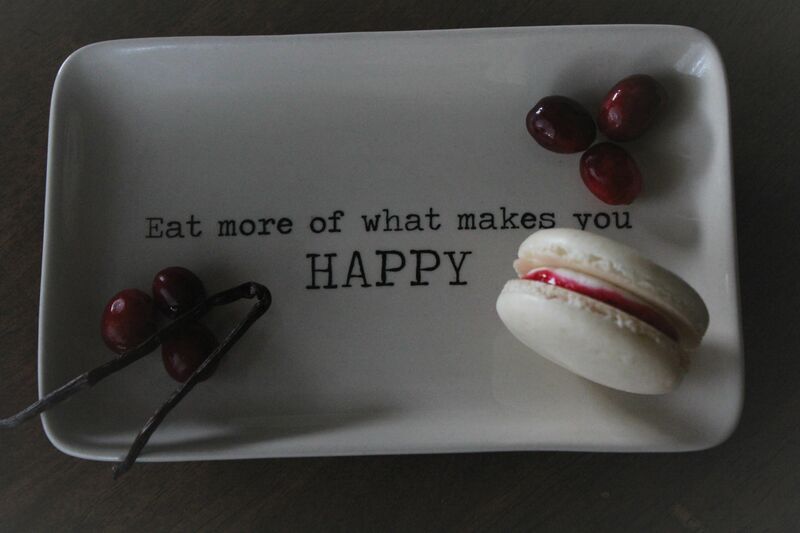 But then I thought, who would eat a kale macaron? I don't even eat kale in real life. So rest assured, my friends, the flavor is not kale. It is a fruit, though! A yummy wintery fruit that I like to put in sangria, because #wine. I love cranberries. They are always one of my favorite dishes at Thanksgiving and Christmas. I love the equal amount of sweet and tart! 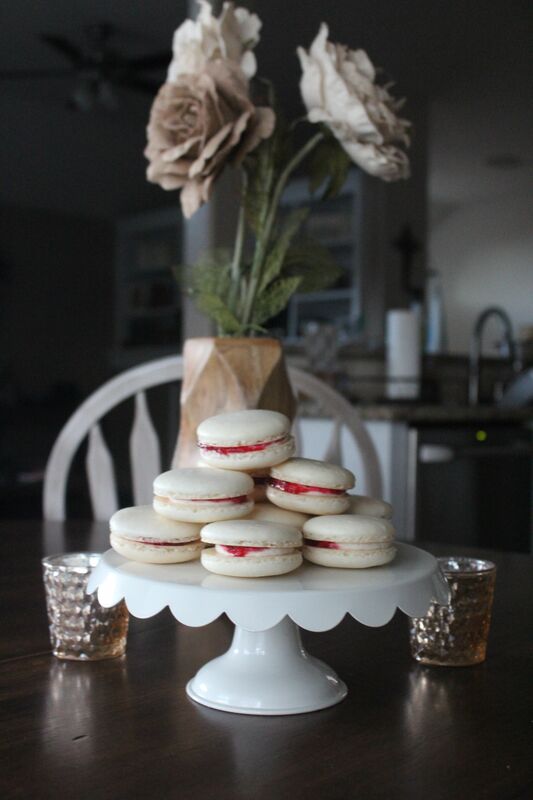 I filled each macaron with a vanilla buttercream and a homemade cranberry butter jam. SO GOOD. Each bite is sugary sweet and tart and fluffy and amazing. Have I mentioned how much I love January?! Any January babies out there? If so, I bet you already knew about garnet being the birthstone for January. Garnet is hands down one of my most favorite gemstones. I even told Zach I wouldn't mind having a garnet engagement ring....just go ahead and pinterest those babies. Swoon. The most common form of garnet is a deep, rich red color, like a good Cabernet ;) It's actually a really hard mineral, too. In geology, hardness is a measure of the resistance of mineral to abrasion or scratching. Hardness is measured relatively on a scale of 1 to 10 on what's called the Mohs Hardness Scale, with 1 being the softest and 10 being the hardest. Diamonds are the hardest mineral of all - they will scratch anything, including other diamonds! Did you know that when we drill for oil and gas, at the tip of the drill bit is covered with diamonds to help cut through the rocks? Those things definitely cost a pretty penny! So back to garnets - one of the reasons that garnets are so hard is because it is a type of silicate mineral and forms covalent bonds (bet you didn't think you were going to get a chemistry lesson when you started reading this, did you?!) Garnet often forms with igneous and metamorphic rocks (at high temperatures and pressures), so you could find garnets in granites (igneous rock) or schists (metamorphic rock). Holla acha girl if you wanna try these bad boys out! Homemade.Cranberry.Butter. Need I say more? !